Computer usage among teenagers is so common in today’s society but misuse of it could lead to very bad consequence. While parents may not able to keep close eyes on them whole day and night and hence the need of good monitoring system is needed to ensure the proper usage. For web browsing, parents may still able to check through browsing history to find out which websites their children had browsed during certain period but in case there is a need to track the computer usage even inclusive offline activities such as reading documents, playing games and etc, then this application software will be able to help you. 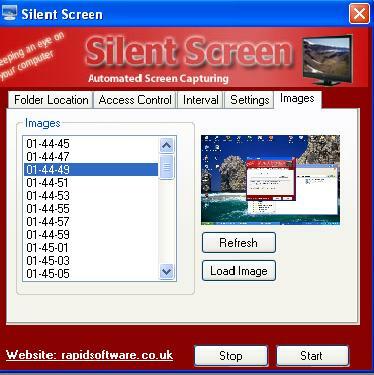 Named as Silent Screen, it monitors all computer usage with screens captured in predefined internal while the application software is running in background secretly. Silent Screen is easy to setup and use. Once after launched, users will be prompted to select specific folder on where to store all the captured images. Besides, it featured a hot key combination that allows parents to hide the small program icon in taskbar, making it totally invisible to PC users. To make it more secure without being able to be turned off by your smart kids, parents can even set password to protect the settings. On top of this, parents can set specific intervals of how fast each snapshot will take place throughout the monitoring process. By default, it will be set to 2000ms (or 2 seconds) but can be changed to suit own preference depending on how many screen captured is needed without overflowing the memory usage. Take note that you will need to ensure sufficient memory space if you intend to lower the interval values since there will be much more image files (in JPG format) being captured and stored in your local hard disk space. The application software is free for 30 minutes usage per session. In case you need longer time than that, users can upgrade to unlimited usage at $6 only. If you think it suits your need, just go and download one for trial at RapidSoftware.